50-year-old Northern Rivers woman Ms Leah Angela Braid had her severity appeal dismissed and prison sentences upheld in Lismore District Court last Friday in relation to multiple animal cruelty convictions for failing to provide food, shelter and veterinary treatment to severely emaciated horses under her care. On 29 August 2017 at Casino Local Court, Ms Braid pleaded guilty to four offences of animal cruelty in relation to failing to provide proper and sufficient food and water, shelter and veterinary treatment to a horse in her care. She received a sentence of cumulatively $6000 in fines (of which only $74 had been paid at the time of hearing) and a two-year good behaviour bond in relation to these matters. 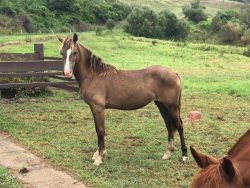 Six months later, the RSPCA received another cruelty complaint in relation Ms Braid’s Bottle Creek property and upon attending inspectors found an emaciated mare and foal. On 29 August 2018 at Casino Local Court, the breach of the original good behaviour bond was called up, and Ms Braid was resentenced to a three-month fixed term of imprisonment. That same day, she pleaded guilty to three additional offences of animal cruelty relating to an emaciated foal. For offences of failing to provide proper and sufficient food to the foal, and failing to provide veterinary treatment, she received a three-month fixed term of imprisonment, partially concurrent with the first fixed term. The total term of imprisonment was four months. She then appealed against the severity of the sentence imposed to Lismore District Court, where two other unrelated severity appeals were also heard together. Judge Wells dismissed the appeal and confirmed orders of the Local Court, including orders for the payment of veterinary treatment costs of $5690.65 for the first prosecution and $1922.00 for the second prosecution. 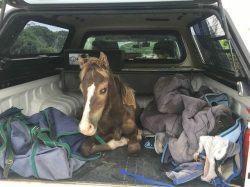 The horses the subject of these charges were ordered into RSPCA NSW custody, and Ms Braid was prohibited from purchasing, acquiring, taking custody or possession of any animal for five years. The first set of cruelty charges related to a severely emaciated horse between October and November 2016. After seven weeks in RSPCA care, the horse’s health improved markedly and it gained 119 kilograms. The second set of cruelty charges related to a severely emaciated recumbent foal with numerous untreated lacerations and injuries. Dehydrated and unable to stand, the foal was seized and transported to a veterinary clinic for immediate treatment. In just eight days of RSPCA care, the foal’s weight increased from 55.9 kilograms to 80.4 kilograms. The mare had been unable to produce milk. The emaciated foal unable to stand. The foal in a vastly improved condition, taken in June 2018, who has since been rehomed. A recent photo of the healthy filly. Judge Wells noted that Ms Braid had consistently failed to comply with orders issued by RSPCA NSW for improvement in the conditions of her horses and had then continued refusing to comply with orders made by the Local Court. RSPCA NSW Chief Inspector Scott Meyers said this was a complicated matter and that he was pleased with the outcome. Ms Braid’s appeals for unrelated police matters were also dismissed. All charges brought under the Prevention of Cruelty to Animals Act (NSW) 1979.